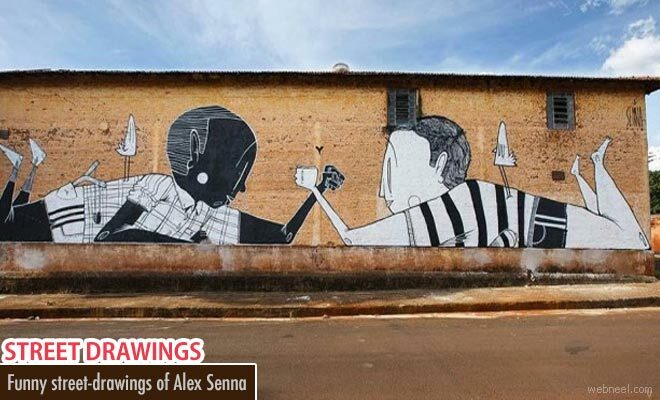 Alex Senna is a Brazilian street artist who creates art with human relations loaded with emotional baggage and interwined with satire. He illustrates urban setting with a simple and clear emotional visual flavor. The illustrations are taken from the imagination of children - hearts, musical notes, balloons, birds to which he adds life through his black and white art. Alex gathers a popular appeal through his playful yet poetic narratives which express human love, romance, and relationships. His popular sketches on city walls ignites the hearts of viewers with happiness and love in simple, clear and straight from the heart. His illustrations are created mostly based on daily life moments with sense of fun and familiarity. All the small stories are interconnected, Senna says, and if one pays close attention, the threads that link them together come to light.